3 things I’ve learned in Italy | Where's Zoe now? Before I moved to Italy, I imagined that after a couple of years, I’d be fluent in the language (ha! ), I’d have learned to cook lots of amazing dishes (I had takeaway pizza for tea tonight), I’d understand Italian politics (ehhhh… maybe it’s beyond understanding?) and I’d be riding around on a Vespa (obviously I’d never seen traffic here). 1. How to appreciate traditional food. Not always, I admit. My pizza this evening was from the place downstairs from me that is run by a Chinese family and sells pizza and Chinese food. (An obvious combination, right?) Definitely not generations of a family from Naples, each son learning from his father how to prove the dough and mix the tomato paste. But I think it’s fair to say that in Italy, “This is just how my grandmother made it!” is high praise for food. I’m only exaggerating a bit when I say that food from the next town over is crazy foreign food that you might eat once a year at a food festival. There are special foods for not just Christmas and Easter but a whole bunch of saints days, as well as the seasons, and the idea of eating something at the wrong time of year is inconceivable. 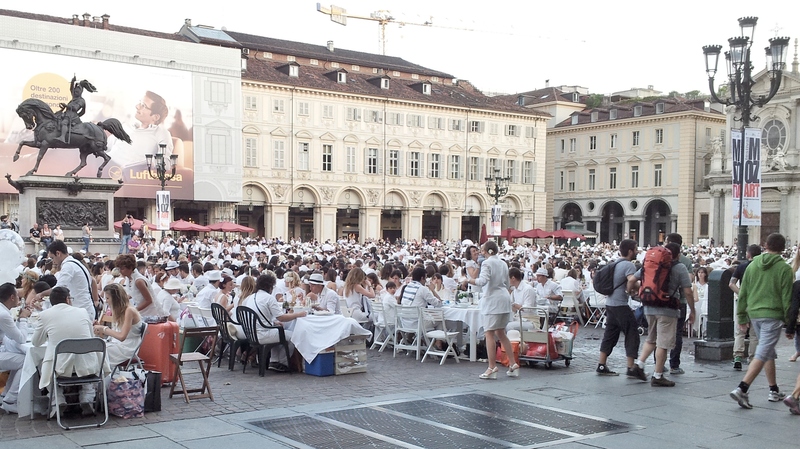 Traditional doesn’t mean “no fun” – this was a dinner-eating flash mob where everyone wore white, that I happend across back in summer. All of which is quite novel for me. I’ve never quite worked out how to answer, “What dishes are typical to where you grew up?” which in Italy is a perfectly good get-to-know-you question, but in Australia makes no sense. And when I go back to Australia, I love that there are Mexican and Indonesian and Vietnamese and Thai restaurants all within walking distance of my parent’s place. But I’ve become quite taken by the idea of having a well-defined cuisine, that you’ve cooked and eaten so long that you understand it perfectly. 2. How to interact with small children. Confession time: I’m not naturally a children person. If you’re a friend of mine and you have kids: your children are wonderful and I legitimately like them. But I have a hard time thinking of anything to say to people about their babies other than, “yup, that sure is a baby.” Toddlers mostly remind me of tiny drunk people. Supposedly if you’re a woman, your hormones are meant to make you want babies. All my hormones have ever made me want is carbohydrates. Before I moved to Italy, I mostly just ignored children, which is easy enough to do; they’re generally pretty low to the ground. But I got here, and everyone is nuts about kids. People strike up conversations with toddlers in the supermarket. Teenage boys (!) coo at babies on the bus. No-one has a problem with kids being around, even in museums and restaurants. Also, toddlers really are like tiny drunk people: you can keep them entertained with the stupidest things and you’ll get bored long before they do. I got a good lesson in this one earlier this week. I’d received a bill for garbage collection services, and Tuesday, the day before it was due I went to the post office to pay it. I would have gone earlier, but the week before, I didn’t get around to it, and the Monday was a public holiday. Turns out, everyone in Torino got the bill at the same time. And it’s payable only at the post office. So I get to the post office, and I’ve got ticket number 190. They’re currently serving number 103. At a rate of about 1 per minute. Yes, I really did spend 90 minutes waiting to spend 1 minute paying a bill. I won’t say I enjoyed the experience, but it certainly taught me patience. This entry was posted in Italy, Living in Turin and tagged cultural differences, expat, food, Italian food, italy, kids, patience on December 14, 2014 by Where's Zoe Now?. I like this idea for a blog post. I actually started my blog with the idea that I was going to write a guide to living in Italy. Two years later, I realised that I still didn’t have a clue and maybe the whole concept of writing a guide to Italy was probably misguided. I have learned one handy trick with Italian bureaucracy, however. You can actually pay the SORIS bill with an F24 semplificato on your bank’s website! (Woohoo!) The first year that I tried this kind of shortcut, however, I only *thought* I paid it and months later I got a collections letter and had to go to some central office to do immediate payment penance. Then again, I know some people who have never paid their trash tax at all. Unicredit don’t seem to offer that option? Or maybe I just misread the website. Apparently you can pay it online if have some kind of account with the post office but I figured that was more trouble than it’s worth… Anyway, let’s hope the payment at the post office worked out, having it go to collection sounds like a massive headache! Yeah, that whole PO account thing seems like just an extra layer of complication! Have no idea about Unicredit, unfortunately. Mine has a menu selection for various services, from refilling your phone to paying taxes. You just have to know how to use them, and as I mentioned before, in the case of my first SORIS payment it totally didn’t work! I’ve been to Italy – it is just an amazing country…but fully agree with the waiting time. No one seems to be in a rush there, except from in traffic!! Take one for getting an appointment, an other for a line in the time of the appointment, one more for giving papers, other for picking up the thing… and for sure you forgot something and you have to take the first number and repeat the process! When I arrived, for getting residence permit, leaning agreement, student ID and health insurance I got more than 15 diferent numers!! more than 3 in the same day ¬¬!! But I love living here, food, chocolate, gelato, pasta, pizza… OMG!!! That makes me forget about numbers! !